Driving back to Phnom Penh was arranged once again by the hotel and we hopped into a tuktuk for the 2 or 3 km to the Bus depot, basically a dirt lot, down a dirt road with numerous buses parked there & guys at portable tables checking tickets. We had purchased with the same company as on the way to Siem Reap as they had such a nice & uncrowded bus on the way there. This was not the case coming back though, and we had to endure a more cramped dingier experience this time. It still made pretty good time for the bulk of the trip, that is until we got to the outskirts of PP. At our late morning lunch break I resisted once again the urge to eat bugs. 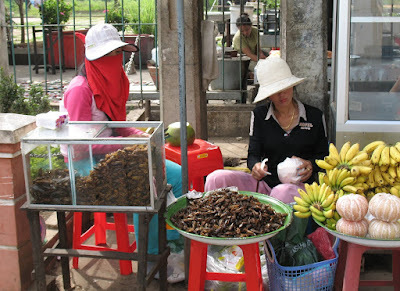 At a roadside stand there were some rather yummy looking grasshoppers and 4 inch long beetles, or where they cockroaches? I'll not likely find out now. We virtually stopped at about noon, by my estimate less than an hour from the scheduled end of the trip. For a while we crawled along through thick traffic, becoming less comfortable as we went due to the air-conditioning having broken down not long before. Soon we came to a complete stop, and the sight of many vans and other vehicles parked in the fields beside the road and lots of folks walking did not bode well. The bus then turned off the road itself, police directing it to do so, into a large dirt lot full of buses and other large transport. With very little explanation we soon had to disembark as it was obvious we were not going to be allowed to travel any further into the city that way. The bus driver and attendants provided nothing in the way of explanation and I got a little pushy in demanding what was going on, at least for the benefit of other English speakers on the bus a for myself. The Tuktuk drivers were the only help, explaing that with the Water Festival going on the bus would not be allowed in. A driver, whose English was very good, said he wanted $5 each for 4 of us to go the last 15 or 20 km to the riverfront where we were going (back to Indochine). We had befriended a French couple on the bus & they did not yet have place to stay. We wanted them to come with us as we knew about the secret petite rooms at Indochine, and how hard it was going to be to get a room otherwise. We also moved quickly to get a driver and agreed to his asking price despite my earlier advice to the other couple that you could often get close to half the asking price for rides. The barrel we were over at this point was fairly significant. Roadblock #2 came pretty quickly as the driver and another one with 3 tourists negotiated through the rough back end of the big dirt field. Several more police watched that side, and after some back & forth chatter we were through, and managed to make another several minutes on what were practically ox cart tracks along the river, before another uniform stopped us. This time our driver told us he was lying to the cop, saying that all of us were on our way to the airport and had to get through. He must have been convincing as once again we were soon going again, and even more remarkably, with no money changing hands. The dirt path also turned into pavement again so we picked up speed and only stopped again once in sight of the hotel. I think in this case the driver probably earned his dough as the quick thinking on his part about the airport may have saved us either a long walk or a healthy bribe or 3 to get into the city. The couple from France were also quite appreciative of the help. They spoke some English but were new to the city and would likely have had a very difficult time finding a room. The petite room I mentioned was almost perfect for them and was only $12, but perhaps I should explain the petite part of it. We had seen these small doorways above the ground floor of the hotel, and had been amused and puzzled by them. I could not come near to walking through them upright, though Linda could just barely. We asked about them and took a look inside a couple of them one day. They were about 6'5" at the ceiling and correspondingly smaller in other respects. They were held in reserve by the hotel staff as a last resort and even though I said I would take one if they had nothing else they were pretty horrified that I would try. The couple from France, being about 5'4" and 5'8" I would guess, were almost perfect for them. Almost is the right choice of words, as Michel told us he DID hit his head at least once! I talked about the Water Festival a few times already, and I mentioned that the city was busy as a result. That's an understatement. The 1,000,000 strong city of Phnom Penh basically doubles in size during the 3 day event that marks the full moon in November, and most of those people congregate a stone's throw from our hotel location. The events primarily consist of races of boats similar to Dragon boats rowed by as many as 50 to 60 men and women. They take place in heats on the Tonle Sap River near where it meets the Mekong and apparently the winning team gets all of $100! The sky also lit up with fireworks and the river later had a parade of sorts of elaborate light displays on boats or barges slowly moving upstream. Or was it downstream? Apparently at this end of the rainy season the Mekong has such an excess of water that the Tonle Sap changes direction and flows backward into the Tonle Sap Lake, doubling its size. We hung out at the river for a while cheering our favourite team (always the one in the rear) and later got out of the madness to our favourite restaurant and then a Lao beer at Broken Bricks with a couple from L.A. (soon Montreal) while Ruby the cat sat in my lap and then finally some CNN at the hotel. Our last night in Cambodia ended on a calm note, though we did get a bit concerned about the guy in the army uniform gesticulating with his handgun before we re-entered the hotel.